Our ePraise is designed to motivate students to do even better and give parents an insight into their child’s progress on a daily basis via mobile devices. Eaalim has designed the online tuition with ease of use in mind. You can study Arabic, Tajweed, Quran and Shariah from the comfort of your home with teachers live from the middle east. Enables you to communicate synchronously with teacher using audio, video or text chat, interactive whiteboard. 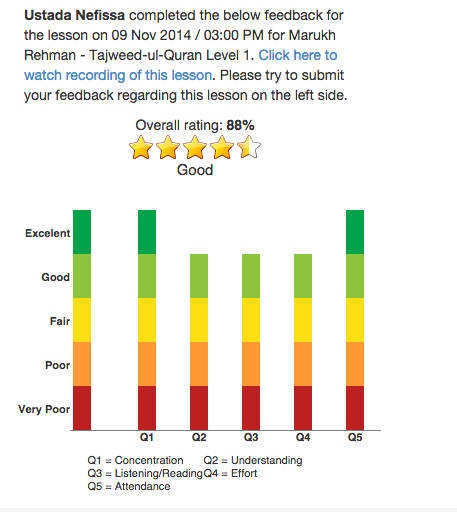 Our ePraise lessons feedback, designed to motivate students to do even better. Live Lessons are also recorded and played back at anytime for revision purpose. A few days back, I was telling my son that we all shall be questioned in our graves, too. He was quite surprised when I told him that the questions would be in Arabic. His logic had weight. By learning Arabic, we would benefit tremendously, I reasoned, as we could be able to understand Quran easily and the whole wide world of religious Arabic literature would be opened for us. We would be able to understand and access all books on hadeeth. Thus, this question started a quest for me, a search for an Arabic teacher, someone who would be able to teach us Arabic, both my children and I. When I started looking for an Arabic teacher, I started facing many hurdles. The first being I could not find an Arabic teacher near us. When finally a good Arabic teacher was located, she lived so far away, that it took almost an hour and a half of driving one way. I grew so worried that I was about to give up my quest for an Arabic teacher. One day, someone told me to look for the Arabic teacher online, and in this way I came across many institutes which offered the services of Arabic teachers. Online Arabic teacher! This was the perfect solution for all my problems. Both my children and I could take classes with an Arabic teacher from the comfort of my home. My research took me across many institutes that offered Arabic teachers and Arabic courses. 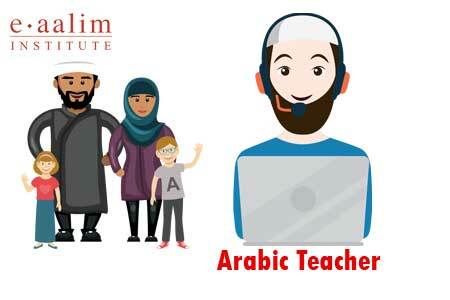 If you too wish to get some classes with an Arabic teacher, try to find an institute like Eaalim, that offers you the services of highly qualified and experienced Arabic teachers, both native and otherwise. You can choose from a large number of male and female teachers, whoever suit your needs more. Institutes like Eaalim, offer private as well as group classes. They teach Arabic putting emphasis on proper pronunciation, teaching you Classical Arabic as well as conversational Arabic. May Allah Help us all in understanding and taking up the teachings of Quran and Hadeeth. Ameen.